You are only as good as the people you surround yourself with. It’s true and extremely important if you are starting a business. As an entrepreneur you can be sure that you will have to make difficult decisions, often times with millions of dollars at stake. In making those big decisions taking advise from the wrong person can be disastrous. 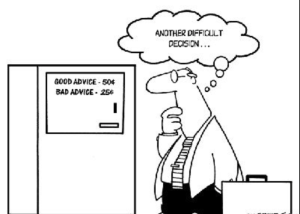 Experts and advisors come in many forms: coaches, advisors, news articles, youtube stars, your mom…but it’s important to remember that all advice is not necessarily good advice. The following post aims to give you some guidelines in choosing the best advisor during your path to entrepreneurship. One of the first questions you should be asking yourself about someone you’ve targeted as an advisor is “Is this person incentivized in a way that works in my favor?” Incentives change everything. Many entrepreneurs seek VC’s for funding but perhaps just as importantly for expertise in a given field. Once a VC invests it is easy to fall into the trap of believing that they are part of your team and that incentives will be aligned. False! VC’s want to maximize returns at exit. Period. As a result, any advice given should be received with that incentive in mind. This not only applies to live feedback but also to any advice received from reading. Ask yourself “Why is this person writing on this topic? Are they promoting something? Are they targeting me for their sales funnel?” While none of these incentives are bad in themselves, they may cause the author to give less than objective feedback on the topic at hand. We all have a base set of assumptions that affect how we approach the world. When evaluating an expert be sure that her ideologies will align with the business you are pursuing. If you are interested in starting a fur company, soliciting advice from a PETA representative probably isn’t the way to go. It is important to explore fundamental beliefs and/or assumptions about the world and your industry before attributing much weight to advice from an expert. Your advisor should have superior coaching abilities. This involves knowing how to have difficult conversations and helping you to solve your own issues with the right guidance. An advisor to your business should engage you in conversations that will train you to think outside the box through probing questions and new perspective. Seeking advice from a “yes man” is the worst thing you can do. You want someone that will deliver candid and relevant feedback no matter the situation. All in all having the right advisor as an entrepreneur is invaluable in making key decisions and in obtaining resources to move your business to the next level. With that said it is also important to trust yourself. Having a team of advisors is about collecting data, ideas and perspectives. Lean on others for support and new knowledge but never forget your core!